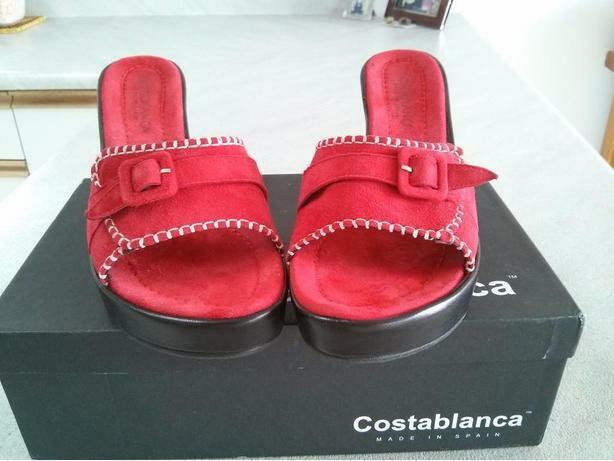 Brilliant Red and extremely comfortable top stitched Salem Suede Slide Wedge Heels with a buckle and Salinas White Stitching. Softly padded inner sole with rubber sole for better traction and control. Made in Spain . Heels are approx. 3" high and are a size 8 Medium or 8B. These shoes were worn once to a wedding. Original Retail Price of sandals was over $200. Purchased at Neiman Marcus.